[SAVE THE DATE] March 7th! CRO on Tap is back by popular demand! That’s right, website optimisation experts, AB Tasty have teamed up with Gin Kiosk (again) to bring you an evening of free drinks and discussion – this time about website personalization. Personalization has fast become one of the most effective ways of putting yourself in your prospects’ shoes. As a result, a myriad of personalization techniques have entered the market – maturing with better data, technical integrations and machine learning – to help marketers get that much closer to true one-to-one communication. 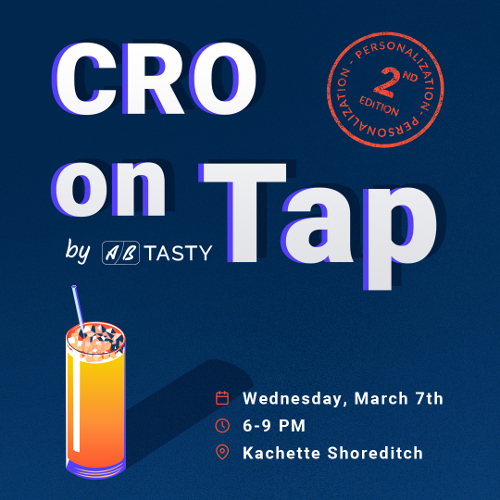 At CRO on Tap, our personalization experts will share insights from successful personalization campaigns they’ve run. Send us a message (uk@abtasty.com) if you want to meet the AB Tasty team!